Crytek's new game engine runs fine on the Wii U, but they still won't be making any games for it. Current industry estimates are putting the Wii U slightly ahead of Microsoft and Sony's current-gen consoles in terms of hardware. Crytek CEO, Cevat Yerli, has confirmed the console is powerful enough for CryEngine 3 - there's at least one game already in development that's using it - but then went on to imply that Crytek won't be developing any games for the new platform regardless. "My opinion of the Wii U is very high," he told CVG. "It's just that we didn't have a business case unfortunately that justifies us making a game for it. 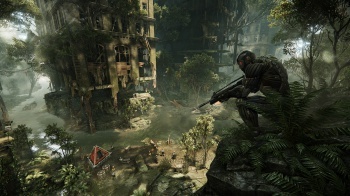 A Crytek rep has previously stated that it's unlikely that Crysis 3, which will be the last traditional retail game produced by the studio before it switches over to a free-to-play model, will make an appearance on the Wii U. "From my perspective I do not understand the public's concerns that the Wii U is weaker than PS3 and 360," Yerli continued. "That I cannot see. From my perspective the Wii U is minimum as powerful as Xbox 360." The Wii U is set to launch this holiday season.